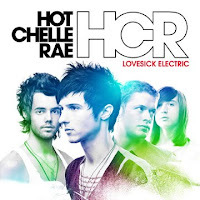 Hot Chelle Rae released a video for "Bleed," the new single from their de but album, Lovesick Electric. But, the video isn't finished yet! They're asking fans to be a part of the process. Check out the first cut of the video and read details, both below. Over the next few weeks while the band is on tour with Sherwood, the guys will be asking fans at their shows to write (or “bleed”) some short thoughts out on a scrap of paper, your hands, your feet, your ticket stub, etc. They will film the lucky fans and their statements, and each week they will update the video with the new fan footage. Once the tour is done, the video will be done. So, keep checking the site for updates, come see a show and be prepared to become part of Hot Chelle Rae history. New York, Hot Chelle Rae will visit us and you have a couple of chances to catch them. They'll be at Highline Ballroom on March 17 and The Fillmore at Irving Plaza on March 28.